In a scrappy affair the Suns would be happy with a first up win that saw acting captain Tom Lynch a key influence in the outcome kicking a game high three goals, taking four contested marks, and having seven score involvements. 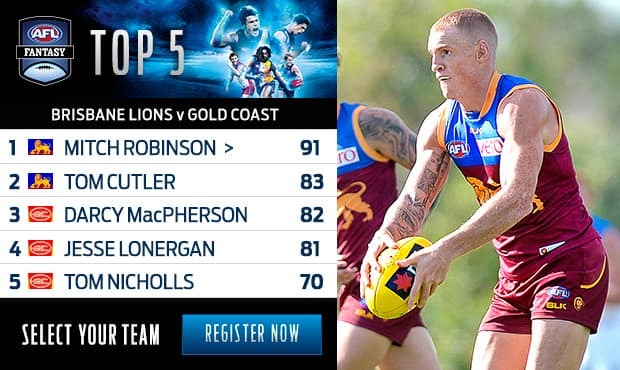 Mitch Robinson has toiled hard for the Lions today with a game high 25 disposals, as well as five marks and three clearances, and 436 meters gained for his side. Rosa also has an equal game high seven score involvements. Matt Rosa is enjoying his first outing as a Sun with a team high 19 disposals to this point in the match including 3 clearances and 3 inside 50s for a total of 306 meters gained. The Gold Coast lead has been built on a hard brand of football today. The Suns lead contested possessions 12096, clearances 37-25, and tackles 62-49. Walker kicks his first goal as a Lion from a strong contested mark on the back of the Lions' first inside 50 of the quarter. Despite trailing by 24 points, the Lions have had the best of the umpiring decisions leading the free kick count 2113. The Suns were eventually able to convert on their dominance that quarter finishing with three goals to one on the back of an inside 50 differential of 16. A strong mark from Wright results in his first goal of the day. Nicholls continues his good work this quarter with his second score involvment and third inside 50 having delivered the football to Wright. The Lions are working hard to even up the tackle count having laid 14 tackles to 12 this quarter but trailing across the match 5640. Lynch adds to his contested mark count with a big mark inside 50 which results in the first goal of the quarter. The goal originated from a Brisbane Lions turnover, the fourth of the match from this source. The Suns have also been dominant in the air today leading the contested mark count 81 with Tom Lynch leading the way with two. The Suns are not taking advantage of their field position dominance this quarter having kicked four behinds in a row while leading the inside 50 count 110! Tom Nicholls has had a great start to the second half with four hitouts, two clearances and two inside 50s. The Lions are yet to go forward of half way yet this quarter. The Suns lead inside 50s 40 and the clearance count 3-1. The Suns take an eight point lead in to the main break having trailed at quarter time. Bewick for the Lions was the stand out player of that quarter with nine disposals, three marks, and one inside 50. 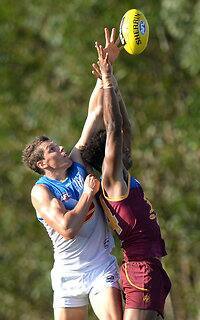 Gold Coast has taken six intercept marks to the Brisbane Lions five. Harwood the only player to have more than one intercept mark for the match. The Suns take the football all the way from defensive 50 to inside forward 50 resulting in the goal to the acting captain Lynch. Robinson is also enjoying his leadership role today leading the disposal count for the match to this point with 12. A bit of an arm wrestle in the first ten minutes of the second quarter with only one goal scored so far. The Lions are leading the disposal count 3128 with both teams going inside 50 four times apiece. Ah Chee with his first goal for the Suns. 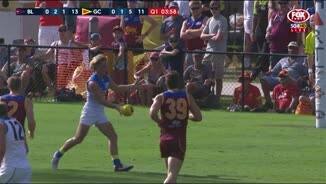 The goal originated from a Brisbane Lions turnover coming out of defensive 50. That is the Suns second goal from a turnover. A behind to Russell after the siren results in a one point lead to the Lions at the first break. After the first quarter the Lions are in front in the disposal count 8567 while the Suns had the better of field position leading inside 50s 14-7. 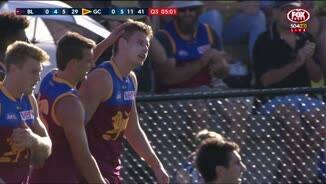 Mathieson kicks his first goal as a Lion with a smart checkside punt from the right boundary. He has had an impressive start to the match with six disposals at 83 per cent efficiency. A classic crumbing goal by Davis for the Suns who make it back to back goals from consecutive inside 50s. The Suns break a run of five behinds with their first goal of the match from 11 entries inside forward 50. Brisbane has kicked two goals from its four inside 50s. Kolodjashnij falls foul of the new protected zone interpretation as he gives away a 50 metre penalty resulting in the Hipwood goal. The Brisbane Lions are working hard early, leading the clearance count 52 and contested possessions 16-11 in a low scoring game. Jackson Paine has started well for the Lions, leading the disposal count with six at 67 per cent efficiency. Lonergan misses a target trying to clear the last line of defensive allowing Taylor an easy possession from the turnover and a clear shot on goal which he converts. Two inside 50s to Gold Coast in the early Minutes.The Lions are yet to go inside 50. In their most recent encounter in round 19 last year the Suns ran out winners by 14 points. Mitch Robinson will captain the Lions today while Tom Lynch will captain the Suns. 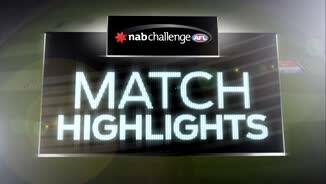 Gold Coast and Brisbane round out this week's NAB Challenge fixtures in Burpengary. Both teams are coming off a disappointing 2015 where they finished 16th and 17th respectively. TOM LYNCH has led Gold Coast to a comfortable 25-point NAB Challenge victory over the Brisbane Lions, but the result was secondary as both teams fielded very inexperienced line-ups. Lynch, who captained the Suns in Gary Ablett's absence, kicked three goals as the Suns extended an eight-point half-time lead to run out 0.9.14 (68) to 0.6.7 (43) winners at Burpengary's Moreton Bay Sports Complex on Sunday. Former West Coast winger Matt Rosa fitted in nicely in his first game in Suns colours, racking up 19 disposals and showing the class and composure Gold Coast recruited him for. In the absence of midfielders Ablett, David Swallow, Jaeger O'Meara and Dion Prestia, Jesse Lonergan thrived with 23 disposals (16 contested and 10 clearances), while ruckman Tom Nicholls was strong both at the contest and around the ground. Rookie Darcy MacPherson, who praises have been sung by coach Rodney Eade during the pre-season, was prominent with 10 tackles and a goal. 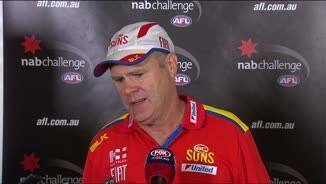 Eade said he was impressed after a slow start in the hot and windy conditions. "Jesse's kicks inside 50 were great." 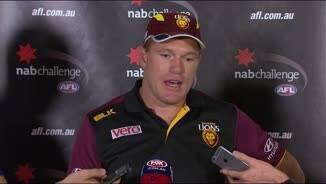 While Lynch was clearly the dominant forward on the ground in the absence of veteran Lions full-back Daniel Merrett, his sidekick Peter Wright showed he could also be in for a big 2016. In just his second season, Wright used his noticeably improved strength to kick one goal, take four marks (two contested) and finish with 11 disposals to show Sam Day he would have his hands full taking the second key forward spot. Touk Miller (16 touches) and Aaron Hall (15) also thrived with their extra responsibility in the midfield. The Lions started positively, leading by a point at quarter-time, but really dropped off as the game wore on. "I'm disappointed with the way we moved the ball," coach Justin Leppitsch said. "We wanted to use the corridor but didn't have the confidence to do so. That was a little frustrating, but that's a young team, breeze there, they're trying to do well, they want to impress and not make a mistake, and often that means you don't pull the trigger. "I think there's some things there that are easily fixed." The Lions started positively, leading by a point in hot and blustery conditions at quarter-time, but really dropped off as the game wore on. They were resting captain Tom Rockliff, ruckman Stefan Martin, Merrett, midfielders Pearce Hanley, Daniel Rich and Dayne Zorko and are also nursing Dayne Beams back to full health after his off-season shoulder reconstruction. Mitch Robinson was tireless in his debut as captain, finishing with 25 disposals, while Carlton recruit Tom Bell showed his value with 19 touches and Rhys Mathieson was strong with 13 possessions. No.2 draft pick Josh Schache was goalless from the one half he played, but with limited chances he showed why he is so highly touted with good movement against a quality defender in Steven May. Brisbane Lions: It was hard to gauge a lot with so many of their best midfielders missing, but the Lions look to have some genuine depth in that area now. Rhys Mathieson and Ben Keays look at home with the big boys, while Tom Bell slotted in nicely. Again it was the slow ball movement that cost them though as they struggled to move from the back half and give the young forwards a chance. The Lions need to play more aggressively to challenge the better teams. Gold Coast: Even without their best four midfielders, the Suns have improved around the contest. They comfortably won the contested possessions (148-115) and clearances (42-29) led by Jesse Lonergan, who had 23 disposals, of which 16 were contested and 10 clearances. Peter Wright has thrown down a serious challenge to Sam Day as the second key forward alongside Tom Lynch with an impressive showing. Wright looks stronger, is holding his feet better and is moving more fluently than his debut season. Brisbane Lions: Carlton recruit Tom Bell was one of the most experienced Lions on the field and also one of the best in his first game for the club. He mixed time between midfield and half-forward and finished with 19 disposals. No.2 draft pick Josh Schache had Steven May on him for the first half he played and showed glimpses of his boundless talent despite going goalless. Fellow draftee Rhys Mathieson was fearless around the contest, winning six free kicks in his 13 disposals (of which seven were contested). Ben Keays (15 touches) was busy, Geelong recruit Josh Walker showed promise as a key forward option, while Eric Hipwood found the windy conditions difficult. Former Cat Jarrad Jansen was quiet, while Josh Clayton kicked a late goal in a quiet game and Reuben William collected six disposals in his one half of action. Gold Coast: Former West Coast winger Matt Rosa (19 disposals) was everything the Suns would hope for in his first game – busy, efficient and composed. Former Kangaroo Dan Currie was also excellent in his first game, feasting in his time in the ruck against the Lions' back-ups and showing he'd push Tom Nicholls for the top job. Rookie Darcy MacPherson was a ball of energy in the forward line, kicking a nice goal and pressuring like a terrier. He finished with 12 disposals and 10 tackles and would be in-line for a promotion if injury struck the Suns. No.8 draft pick Callum Ah Chee took a contested mark at the top of the goalsquare in a polished performance, while Ryan Davis kicked a nice goal and Tom Keough defended strongly on young Lion Eric Hipwood. The Lions can expect another hot one for their second NAB Challenge fixture in two weeks, heading 1000km north of Brisbane to Mackay to take on St Kilda. The Suns meanwhile will make the longest trip in the country, flying west to Joondalup to take on West Coast on March 3. With such a long trip, expect them to take a significantly weakened team.